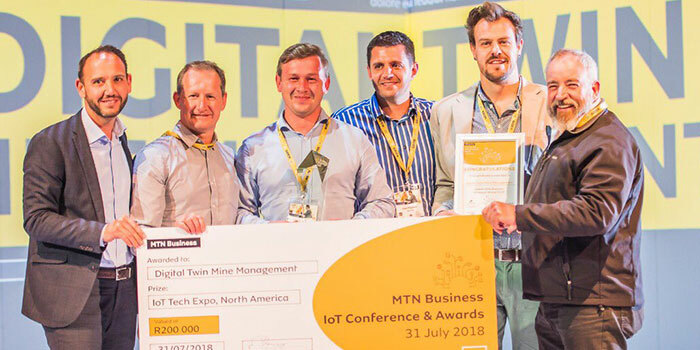 The collaborative solution, Digital Twin Mine Management, was awarded the top accolade of MTN Business IoT Solution of the Year at the third annual MTN Business IoT Conference and Awards held at Kyalami Conference Centre today. The FlowCentric/MineRP solution also walked away with the Best Industry 4.0 Solution award. MineRP, in conjunction with FlowCentric Technologies developed a real-time mine monitoring solution. The Industry 4.0 solution uses IoT-enabled sensors, provided by Sperosens, to monitor the mine environment and deliver real-time data regarding airflow, temperature, gas, smoke levels and other relevant information. The solution makes use of virtual reality (VR) technology to provide users with a fully mapped digital twin of the mine terrain. Users can navigate through the virtual tunnels to check on the available sensor data. If any actionable data is detected the appropriate business process can be initiated either automatically because of the sensor data, or by the user through the VR environment. Once a process has been initiated, the FlowCentric Processware engine will route tasks to the appropriate personnel and divisions to coordinate and complete. The business process management (BPM) software ensures that each task is completed in a compliant, efficient manner, while maintaining a complete audit trail of each step in the process. The FlowCentric Technologies/MineRP collaboration delivers a cross-platform solution that turns IoT sensor data, and the corresponding digital twin, into proactive company assets. The solution is capable of alerting personnel to real-time changes in the mine environment and allows users to initiate the appropriate workflows in both VR and desktop environments. The solution’s VR component is used to provide specialists with an improved spatial understanding of the underground environment without the need to physically be on site. This powerful tool enables experts to perform the same tasks that would traditionally have taken hours, in mere minutes. Specialists no longer need to travel to a location in order to evaluate the environment, they can interact with the digital twin from anywhere in the world and initiate real-world changes through the VR environment. Long-time FlowCentric ISV Partners MineRP are an internationally recognised mining software and consulting company with a rich set of unique mining technical products and solutions. Commenting on the collaboration between MineRP, FlowCentric Technologies, and Sperosens Franco Megannon, MineForms Product Manager, MineRP explains that in an increasingly competitive market, no single vendor can provide a solution to a client without working together in an ecosystem. “Our solution demonstrates the ability for multiple vendors to interact seamlessly with the same data across various platforms, from tablets, to desktops and even virtual reality. Industrial IoT is meaningless if you do not have the processes in place to analyse and act upon on the information gathered." FlowCentric Technologies CIO, Denis Bensch concurred, adding that BPM is fast evolving to include better integration with modern technologies and cloud-services, specifically IoT sensors. Bensch concluded by thanking MTN Business for a superb, insightful event, and reiterating his appreciation for the all the hard work that the FlowCentric Technologies, MineRP, and Sperosens teams have put into the Digital Twin Mine Management 4.0 solution.